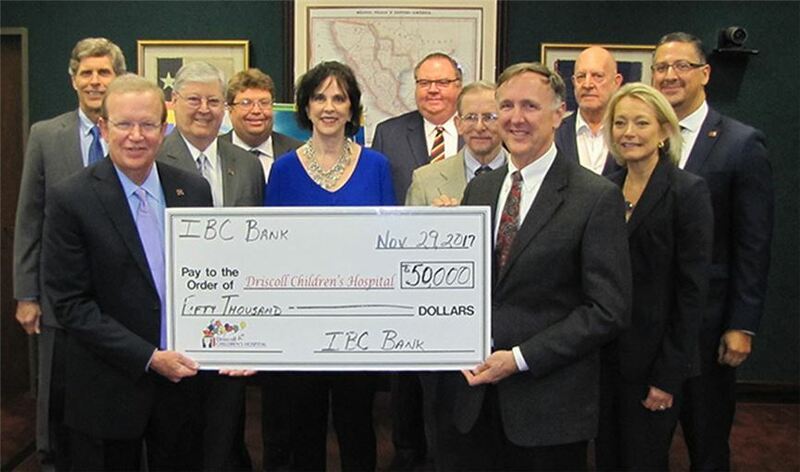 IBC Bank-Corpus Christi gift will assist with new building project. Harold Shockley, Jr. presents Driscoll Children's Hospital with a check for their capital campaign. Third row: Jim Shiner, IBC Bank-Corpus Christi Board Member; Willard Hammonds II, IBC Bank-Corpus Christi Board Chairman; Gus Barrera, IBC Bank Senior Vice President; and other Driscoll representatives. Second row: Dennis Nixon IBC Bank CEO and Chairman; Susie Black, IBC Bank-Corpus Christi Board Member; Richard Thomas, IBC Bank-Corpus Christi Board Member; Martha Avery, Driscoll Children's Hospital Vice President of Development. First row: Harold Shockley, Jr., IBC Bank-Corpus Christi President and CEO; Alex Kirkland, Driscoll Children's Hospital Board President. (DECEMBER 21, 2017) CORPUS CHRISTI, TEXAS - IBC Bank-Corpus Christi donated a Leadership Gift of $50,000 to Driscoll Children's Hospital to assist with building a new two-story, 70,000-square-foot pavilion, in addition to helping the hospital meet a $1 million Challenge Grant from The J.E. and L.E. Mabee Foundation. The $50,000 check, which was presented to Driscoll Children's Hospital in November at a special event, will assist in the creation of a new Outpatient Surgery Center and the relocation and modernization of the Pediatric Intensive Care Unit (PICU). "The addition of the new central physical plant will ensure the right level of capacity for the entire campus and any additional growth down the road," said Martha Avery, Vice President of Development for Driscoll Children's Hospital. "We are proud to have IBC Bank-Corpus Christi as a partner in our mission of providing ‘hope and healing' for the children of South Texas in their time of need." Harold Shockley, Jr., IBC Bank-Corpus Christi President and CEO, said the donation to the Driscoll Children's Hospital is not only helping families who live in the Corpus Christi area, but also other South Texas markets, including Laredo and the Rio Grande Valley, who seek treatment in its pediatric specialty clinics. "IBC Bank and Driscoll Children's Hospital have served South Texas for a number of years," said Shockley. "We are honored to be a partner and support this outstanding hospital." IBC Bank-Corpus Christi is a division of International Bancshares Corporation (NASDAQ: IBOC), a $12.2 billion multi-bank financial holding company headquartered in Laredo, Texas, with 193 facilities and more than 296 ATMs serving 88 communities in Texas and Oklahoma. In 2016, IBC celebrated its 50th anniversary since it opened its doors for business in 1966. IBC Bank's slogan "We Do More" reflects the bank's dedication to the growth and success of both the customers and the communities it serves. International Bancshares was ranked 46th on Forbes' prestigious list of 100 Best Banks in America in 2017. IBC Bank-Corpus Christi has been serving the Coastal Bend community since 1995 and has a retail branch network of nine locations. MEMBER FDIC / INTERNATIONAL BANCSHARES CORPORATION. Visit us on our YouTube channel, IBCBankWeDoMore. More information is available at ibc.com.